/ Uncategorized / 03/14/2015: What Does It Take to Stand? What Does It Take to Stand? I grew up a Buddhist in Burma. At age 27, I began taking Bible studies in a refugee camp in Thailand and fell in love with Jesus. As I studied His life, I said to myself, “Jesus Christ lived according to the Bible and kept the Sabbath. If I want to become His follower, I should do the same as He did!” I remember how sweet each Sabbath was to me, as a new believer. I experienced peace and enjoyed the extra time with God and the privilege to rest on His holy day. My wife Yi Yi and our two-year-old daughter Phyusen, repatriated to the United States before me. Yi Yi knew very little English and struggled to survive as a “single” mom. She managed to get a good job, but she had to work on Sabbath. Her employer did not know God, so she thought there was no way he would grant her request to take Sabbaths off. It felt like a battle lost from the start and she shared with me how guilty she felt each and every Sabbath she worked. Six years later, I was finally able to join my family in the United States. The first six months after my arrival were the most difficult, as I desperately tried to adjust to the new language, cold weather, and the new role as a “stay-at-home dad.” As we watched our precious girl grow and learn to speak, we increasingly felt the need to raise her up in the Seventh-day Adventist faith, but how? With limited English, we were afraid to attend an English-speaking church and knew of no Burmese-speaking Adventist church. 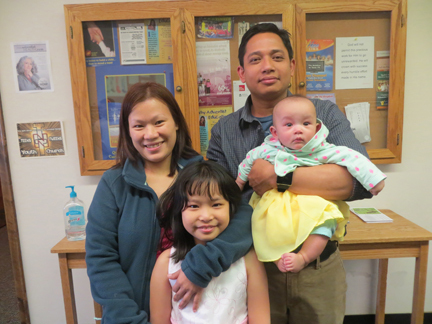 Finally, when Phyusen was in kindergarten, we took her to a warm, friendly Adventist church for Sabbath School. However, three years went by and our faith dwindled. I found a job and worked on Sabbaths, too. Because I worked nights, I was able to attend church and Yi Yi would often remind me, “It’s Sabbath, you know.” But I felt the need to rest up for work and we often did not go. In our culture, children’s birthdays are very special, a time for a big spiritual celebration. We usually have a worship service, where a pastor comes to the home and gives a sermon and a special prayer of blessing for the child. This was a problem for us because we had not connected with a pastor! One year, I had to invite a Karen Baptist pastor, but since I am Burmese, I could not understand his message. Another year, Pastor Silas from Fort Wayne, Indiana, came, but because he lived so far away there was no way he could come every year. But he connected us with Pastor Sam Ngala. Pastor Sam Ngala laying hands on Phyusen. 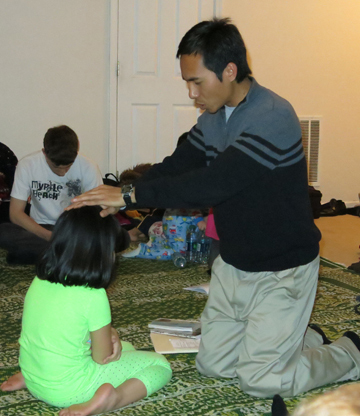 After that, we visited Pastor Sam’s small Burmese-speaking church occasionally and saw how it began to grow. Pastor Sam persistently invited us to church and special functions and we always felt at home and welcome there. He encouraged us to take a stand for the Sabbath and for God. The Lord used him to energize our faith and to compel us to trust in Jesus. He challenged my family to stand for what was right and assured us that we would be blessed. Even before we asked God for Sabbaths off, He showed us His love, mercy, and blessings! We wanted to have another child but were unsuccessful. We spent a substantial amount of money on specialists, but found no answers. My wife became pregnant, but because the baby was attached to the wall of the uterus she had to have surgery and had a miscarriage. We knew that only God could give us another child. Yi Yi fasted and prayed and we asked Pastor Sam to pray for us, too. We rejoiced when she finally became pregnant again. She stopped working when she was seven months along and we started attending church regularly. A spiritual revival began in our hearts after God answered our prayers for a child. I was thrilled to see my wife, who is terrified of public speaking, joyfully share her testimony with others. Yi Yi and I had a serious discussion about how we were still working on Sabbath. The Holy Spirit deeply convicted our hearts. God is so merciful, so loving, in hearing the prayers of sinners. How could we continue in sin when He blessed us so greatly? As we drew closer to God, intentionally seeking Him, we gained the strength to make the decision to stop working on the Sabbath day. Baby Cindy Zin was born and Yi Yi went back to work. She informed me, and then her boss, that she would not continue her job if she had to work on Sabbath, from sunset on Friday to sunset on Saturday. L to R--Yi Yi, Phyusen Kyaw, Kyaw Nanda Zaw, Cindy Zin Kyaw. To our surprise, God honored our faith and answered our prayers, and we have both received our Sabbaths off from work! I had to explain Seventh-day Adventist beliefs to my supervisor, but that gave me opportunities to witness to my colleagues as well. After observing other refugees going through this same battle, we shared our testimony with the other church members and they have been moved to make hard decisions as well. Our whole family gets excited when Sabbath comes each week. We have peace of mind and great joy. “If you turn away your foot from the Sabbath, from doing your pleasure on My holy day, and call the Sabbath a delight, the holy day of the Lord honorable, and shall honor Him, not doing your own ways, nor finding your own pleasure, nor speaking your own words, then you shall delight yourself in the Lord; and I will cause you to ride on the high hills of the earth, and feed you with the heritage of Jacob your father. The mouth of the Lord has spoken.” Isaiah 58:13, 14. By Nanda Zaw Kyaw. Visit www.reachtheworldnextdoor.com to learn more about reaching out to refugees.